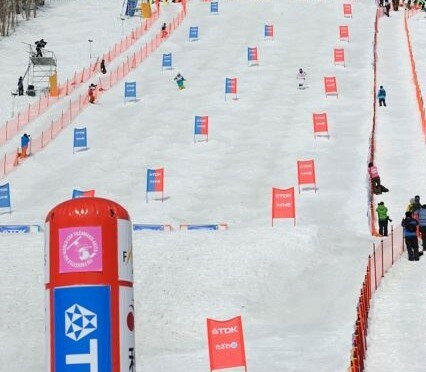 Tazawako, Japan – Canada’s Mikaël Kingsbury won the 32nd FIS World Cup moguls competition of his career on Sunday in Tazawako, Japan, during a dual moguls event. Kingsbury defeated American Thomas Rowley by a score of 20-15 to capture the title. Frenchman Benjamin Caven finished third after defeating Dmitriy Reiherd of Kazakhstan 22-13. It was an impressive weekend for the 23-year-old Kingsbury, who also finished second in the single moguls event behind American Brad Wilson, who finished fifth on Sunday. Sunday’s victory is Kingsbury’s fourth of the season in eight attempts and his seventh time on the podium overall this season. Dating back to last season, Kingsbury has won 11 of his last 15 World Cups. Rowley, of Long Beach, N.Y., battled through five rounds of dual moguls to land his second career World Cup podium next to Kingsbury. Rowley, who was named World Cup Rookie of the Year last season, skied a strong middle section throughout the competition. After consistently finishing in the top 10 and top 20 this season, Rowley was happy to find the podium. On the women’s side, Deborah Scanzio of Switzerland took the win, the first out of 106 World Cup starts in the mogul veteran’s career. Canada’s Audrey Robichaud and Chloe Dufour-LaPointe each earned their second podiums of the weekend, finishing second and third. The U.S. women struggled and let the course get the best of them, with Mikaela Matthews, of Frisco, Colo., posting the lone top-10 finish in eighth. Jaelin Kauf, of Alta, Wyo., was the next highest U.S. finisher behind Matthews in 11th. World Cup moguls teams now prepare for the last FIS World Cup of the season taking place in Moscow, Russia, this Saturday. 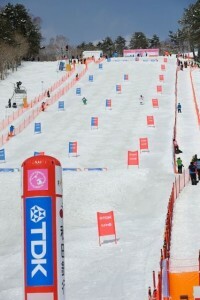 The Moscow event will take place on scaffolding, which will be a unique venue for the mogul skiers.